May 21st, 1992 - Where was Bosley Sr? Below is the state honor roll with Phil Downs leading the 1600 and 3200 respectively at 4:15.6 / 9:12.1. Bosley was no where to be found in these lists. I’m going to take a guess. Andy was very different than drew in that he just ran to win he almost never ran faster than he needed to in order to win. He didn’t run solo efforts and was fine winning a mile in 4:48 if second was 4:49. Given the honor roll in front of me I’m guessing he wasn’t pushed outdoors as I don’t see north shore runners and he just ran to win. I don’t recall him being hurt but I wouldn’t have known I just saw the state meet result that year and him upsetting downs. Also I thought homestead had a good 4x800 that year with bosley and Scott Herman so they may have been running that event a lot. I thought the 1992 4x800 broke homesteads 4x800 school and north shore record that was previously set in 1988 on a cold day at conference of 8:07.3 in 1988. Again I may be mistaken the 1992 squad may not have broken the record but I think they did. Who knows when I looked many years later the 1988 record didn’t even have the names of the athletes correct in the record books as one of the names on the relay was omitted by a name that wasn’t even on the track team last time I looked lol although I’m sure it’s correct in the north shore record books and newspapers. It’s just interesting that both Bosley’s aren’t very team oriented. A lot of people hold Andy Bosley on a legacy pedestal based on his accolades as an athlete. Which I think doesn’t necessarily hold true. He has mentored a couple individual standouts – Marcus Paulson and his son – but I am not sure he can compare to someone like Tom Kaufman of Madison West. TK is a great centerpiece for the Madison West program and as a teacher-coach does an excellent job cultivating young people building them around lessons through sport. He understands on a higher level what sport is whereas I think Bosley is perhaps an overgrown elite longing for his competitive days and living through the athletes he chooses to mentor. This is a very key difference. When we get to Lueck-Bosley Sr types they are sometimes simply more in it for the reflection of themselves and while great mentors for potential elite athletes who remind them of themselves not necessarily patient with kids who need guidance and support all around. The types that could benefit with more of a belief system than the herding cattle approach. One type delivers a greater good for all types to build a program and culture whereas the other cherry picks for the elite types only. Great trip down memory lane. 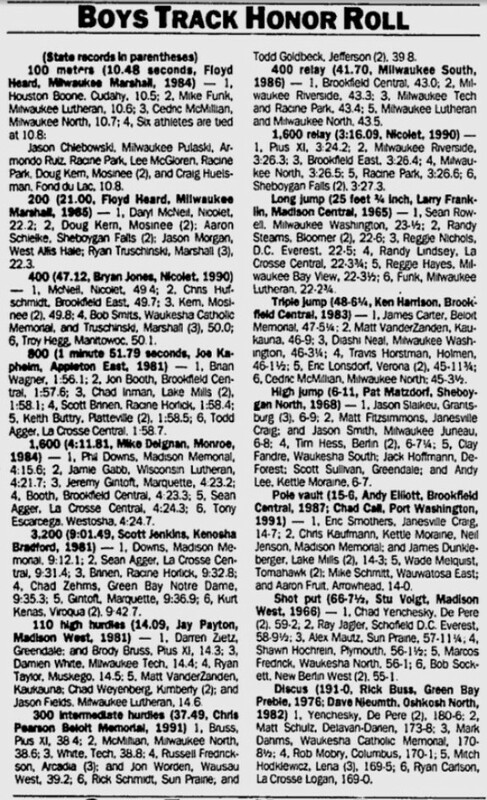 I was a freshman in 1992 and there are so many names on here that I can remember seeing competing, in all events, and thinking that they were studs that would be impossible to ever compete with. This may be the wrong place to put this kind of post, perhaps it needs its own thread, but I have felt, for a long time, that parents coaching their own children is a very slippery slope. You often hear about nepotism in other sports, but I have seen it happening in T&F and Cross Country, and have seen it at every level, including college. Let me begin by saying that this is all speculation. I don’t know Coach Bosley, nor have I ever spoken with him even briefly. I do agree with @zen, that I am surprised that he has not had more team success, especially given the resources at the schools he has coached at, but there could be several other factors at play. Knowing the mindset of some other parent-coaches I have encountered over the years, I would be very surprised if Bosley tripled at state. One, he could conceivably lose the 800, and that could “tarnish his legacy.” Two, running the 800 could decrease his chances of setting the state record in one of the other distance events (I don’t know the state schedule off hand, maybe this will not be an issue). Strangely, I do think that if the younger Bosley child was on the team currently, they would give it a run in the 4x800 (ala the Seidels). I think Homestead will take the 20 points from Bosley, get whatever points they can in the jumps, and hope it works out for them. They’ll certainly still be in the hunt with 30-40 points. I can give some notable examples of parents who, despite having studs for kids, did not let that take away from the “team.” Chris Ramsey’s best runners have at certain points been his own children, but that has never taken away from the team trying to win the state meet. Arnie Miehe from Darlington has had several of his children be great runners, but that has never gotten in the way of going for the team title (which he has several of). Even Eric Lueck at Wisconsin Lutheran, despite what one may think of him, has never let the desire for his children to be successful get in the way of the team achieving their goal. Wisco has had numerous successful teams in both track and CC, with and without any Luecks on them.